"“Offering a picturesque beach retreat with easy access for visitors to conveniently enjoy the amenities of nearby towns and the rest of the island…”"
A gorgeous natural location nestled in the heart of a Maltese National Park it is famous for its gorgeous beach that is renowned for the quality of the snorkelling on offer. Coupled with this is the spectacular Il-Majjistral Nature and History Park, a wildlife reserve that was the first designated national park in Malta. The area is on the north-western coast of the island, meaning it is especially famous for its sunsets, which spray the sea with beautiful hues of pink, purple and orange. This makes it a favourite destination for horse-riding enthusiasts with spectacular evening rides available on its craggy clifftops. All of this and more makes Golden Bay the ideal place for people who want to have an active holiday surrounded by majestic nature. A gorgeous sandy beach, it is located beneath a sheer cliff face on the north-western coast of Malta. It is the first of a series of stunningly beautiful beaches, including Ghajn Tuffieha and Gnejna. It is situated in an unspoiled area of the country and is famous for its cream sands, shallow waters and excellent facilities. 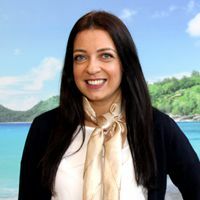 This makes it the second most popular beach on the island of Malta and the ideal destination for anyone who wants a relaxing and fun beach holiday. The area is also renowned for the quality of its sunsets, which exude, shades of pink, purple and orange over the already magnificent seascape. Ideal for exploring the majesty of nature, the Il-Majjistral Nature and History Park are the perfect place to teach children about Malta’s wonderful wildlife. The snorkelling around Golden Bay itself is legendary with a host of protected marine life that older children will appreciate seeing. This coupled with a range of great hikes and other beach activities, makes it the perfect destination for active families that want to have fun. 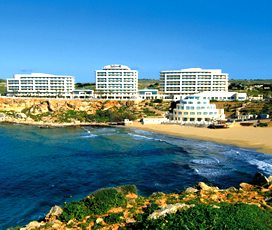 Golden Bay has a good selection of activities for visitors to enjoy, foremost of which is the stunning beach, considered by most to be the second-best beach in Malta. It is famous for its creamy white sands, excellent snorkelling and the way that the sunsets over it in the late evening. Also, of interest to visitors is the Il-Majjistral Nature and History Park, a protected area, famous for its unique wildlife and excellent snorkelling. Furthermore, there is the Golden Bay Horse Riding club, which provides clifftop rides in the late evening, allowing riders to see the purple, orange and pink hues of the Mediterranean Sea. The bay combines spectacular natural beauty, with several great places to eat and drink. It is situated on the north-western coast of the island meaning that it regularly witnesses magnificent sunsets, making it ideal for people who want to enjoy a romantic meal in a truly spectacular setting. The nearby towns of Bugibba and St Paul’s are the places to visit for those who are seeking a livelier setting. Known for its unspoiled natural beauty, it is not the kind of place where visitors will find international shopping outlets. Several places will sell essentials, however, the towns of St Paul’s and Buggiba are better for those who want to enjoy shopping.